Ideal for All Bettas A Scientifically Developed Diet For All Types Of Bettas. Hikari® Betta Bio-Gold® has been developed after considerable research into the eating habits and nutritional requirements of bettas. 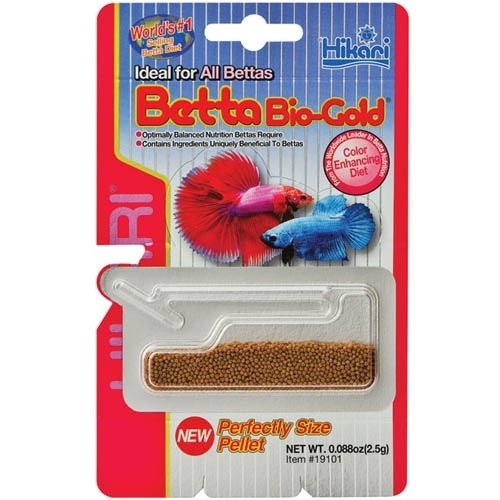 This floating pellet has been finely tuned to meet the nutritional needs of your pet betta. The inclusion of: (1) premium select fish meal which provides a superior protein source (2) Astaxanthin and Spirulina which helps enhance coloration (3) flavor attractants, like garlic, which promote rapid acceptance and (4) a high concentration of useable nutrients your betta longs for make this a daily diet perfectly suited for your fighting fish. Look for our other premium diets which your betta will also enjoy; Micro Pellets®, ®Bio-Pure Frozen Blood Worms and ®Bio-Pure FD Freeze Dried Blood Worms. Feed 5 to 10 pellets up to 3 times daily based on the size of your betta (visit www.hikariusa.com for more specific feeding instructions based on size). Avoid over-feeding. Bettas are finicky eaters and often resist a new type of food. Continued use will ensure acceptance. It is not uncommon for bettas to take up to 5 days to adjust to a new food.